Good thing this warm fall is a total fluke, right? Yes it is a good thing, today is the hottest day this year here, about the 4th day of 90’s all year here. So yeah it’s a fluke, at least here.Unless September is the new July? Works for me! Picked Summerset about a week ago. They have softened some, but are still quite firm, and they have a great peachy flavor with plenty of acid. These are already peeled and are going into a peach upside down cake tonight. This tree is a keeper for sure! Indian Free came off less then a week before Summerset, but either the kids got 'em, or they dropped and the critters did. A very large Autumn Star. There are more on the tree. These mating OFMs were on my Autumn Star on Sept 16 when the pic was taken. 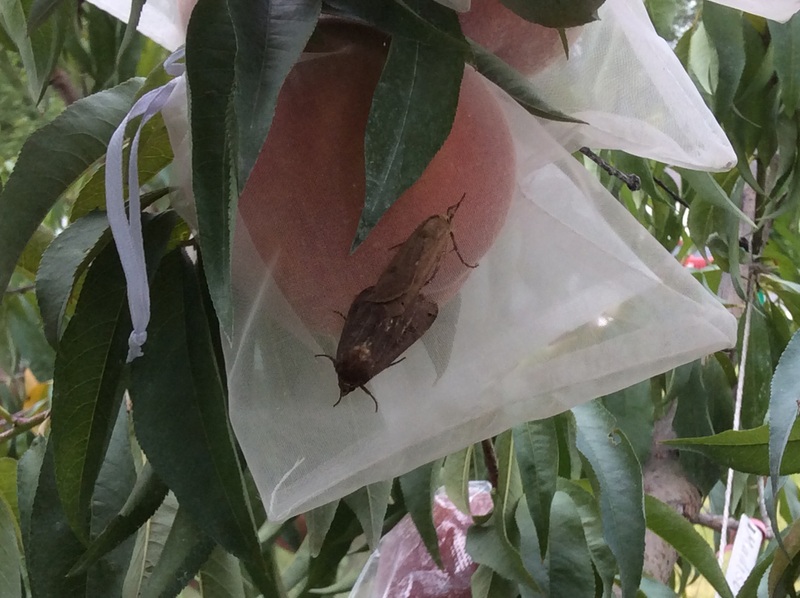 Thank Goodness that I have bags with some Surround on my peaches. Sept would be way too late to spray but these bugs can still cause damages. I picked this peach last night. The tree has been in my orchard 3 years and had two peaches. It was marked an Elberta from a big box store. 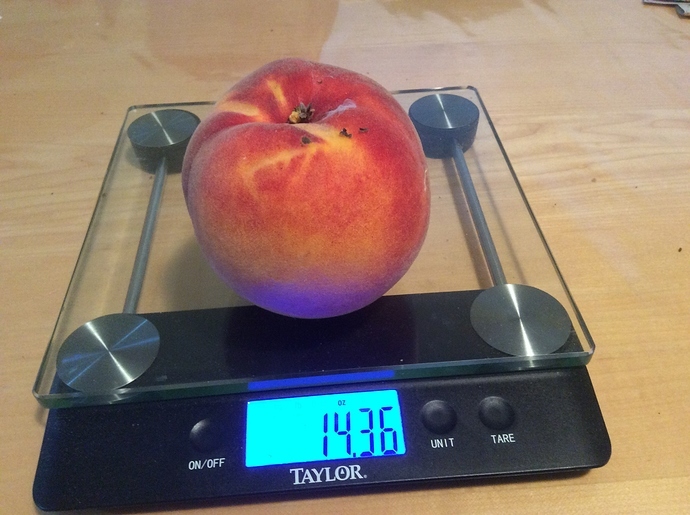 This peach is 6 weeks later than all of our other peaches. It was thick skinned, very dense and wonderfully sweet. I got two bites and my daughter hammered the rest. Do you know what cause internal rot, please? these are late peaches. They were ripe when I picked them. After a day or two after picking, they started rotting from inside. I have seen more and more this past week. Were they overripe resulting rotting from inside out? They looked good outside. No sign of insect tunneling. No sign of outside brown rot. So sad to see good peaches gone bad in a day. It seems a lot of lates need to be picked while still firm- did you do that? Hmm, Mamuang. This is one of the hardest direct questions regarding peaches for me. For the reason I see it occasionally, but not often. I give quite a few free samples via grabbing a random peach and cutting it in quarters. Occasionally I run across a peach rotting from the inside. When this happens, I toss the peach. On rare occasions I’ll have one of my customers mention a problem with inside rot on some of their last peaches. I replace those. I think Alan’s right that mostly it’s seen in the most ripe peaches. Though I have seen it in the hottest weather 100+F, especially with some white peaches. I’ve not been able to totally pinpoint the problem, but your question reminds me of this issue. I need to look more carefully to see a possible cause. I realize this isn’t much of an answer, but thanks for bringing it up. I will be paying more attention to this issue, for my own curiosity in the future. Most of them are not firm. They somewhat soft, ripe, maybe, very ripe. That is why I thought it was overripe. @olpea gave me something to think about regarding heat. This past 5 days, it has been hot. The temp in low 80, very humid. It is hot for this time of the year in New England. A couple of days ago, some city broke a high temp of late Sept record. Prior to this past 5-6 days, i did not notice this issue. 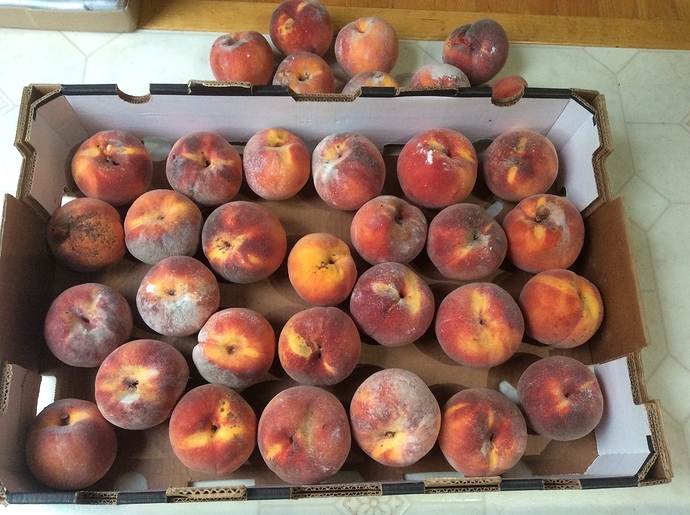 It is true that peaches picking this week would be riper than the ones picked last week ( but not all) Possibly, a combination of very ripe peaches plus a hot temp is a perfect storm of this problem. I’m losing most of my Indian Red Free crop, some of it to rot. I believe some ovaries of the flowers were damaged in mid-Feb causing part of the problem- a lot of the peaches just ended up not sizing up- that was also a problem with nects, but less so. 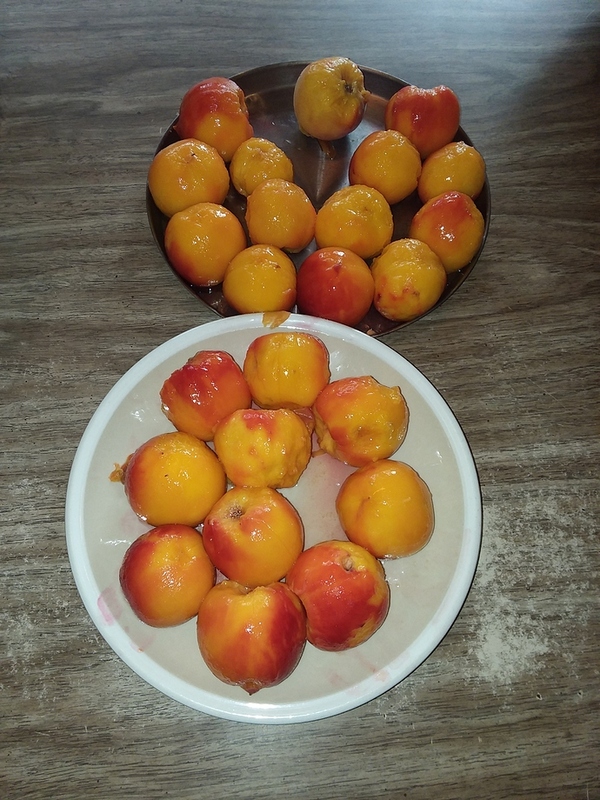 I’m getting rot also from split pits so just as the peaches ripen fruit is contaminated by the funky rot juice from the inside. I believe the other rot just occurred because too often rain water sat around the stem and the rot started there and worked its way into the fruit without being apparent on the outside. I think a lot of this also happened to other of my late peaches and the very warm weather we’ve lately had may have tilted the show to rots favor where ever it had an opportunity. What are the signs of a peach rotting from the inside, like a pear? It oozes bubbles up or when I put the stem end down overnight, it leaks the next day. The recent ones that rotted during warm weather did not have split pits. All my peaches have been large this year. But your theory about water getting in, warm, wet sounds reasonable to me. Bill Shane claims Victoria can get overmature flavors if left on the tree too long. I haven’t noticed it, but I do pick Victoria a little earlier than a lot of peaches. It tends to drop really bad here if left too long. I think the drops is why he picked it. He must not have had that much, as he didn’t have any left by the time I came by, so I didn’t get a chance to test for off flavors. One of my Carnivals dropped and though it had some damage (2/3 of it was OK, but it looks like there was a worm, then wasps), it was very tasty. An all-time high brix (for a peach) of 23. It was probably helped along by the warm sunny weather we’ve had recently (4 days in a row in the 80’s). In fact 10 of the last 15 days have been close to 80+, with less than 0.3" of rain. I got my Pumpkin Spice today from Burchell’s. I looks pretty good and has decent branching. The trunk is 5/8", with the thick part being about 2’ tall and new growth bringing the above ground height to just over 3’. 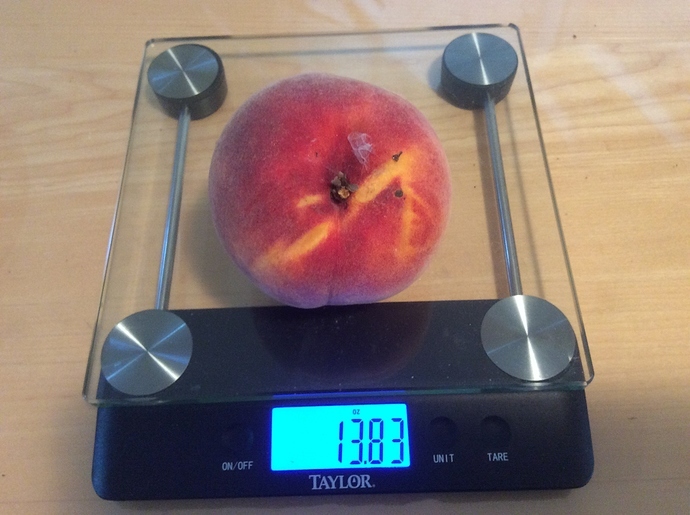 I am really interested in how this peach does for you since it is so late and I assume on Citation rootstock. The Carnival is on Citation. The Pumpkin Spice is on Nemaguard. All the ones I wanted were on it and Heath White has done fine on it so far, so I figured I’d give it a try. And what is their excuse for not offering a bare root alternative? Not exactly eco-friendly shipping all that weight around for no practical reason. Last batch yesterday. At least 4 had internal rot. This year AS are large. Several of them weighed between 12-13 oz. Overall, they taste sweeter and more peachy than the PF24C. Here is one of the biggest ones. Since we ship all of our plants potted in soil, yes we are able to offer shipment year round. In the winter, we monitor weather.com and hold shipment temporarily if weather is too extreme. We add insulation to the trees as weather dictates, packaging each carefully by hand to ensure the best possible tree when it arrives at your home. In the summer, we water very well before the plant’s departure. Unlike our competitors who mostly ship bare rooted plant material, our plants, by traveling in the only soil they’ve ever known experience much less stress in transport. But, it probably comes down to more of a business concern- being able to ship year round and differentiate their (very expensive) trees. I know that buying it wasn’t an economically thrifty decision, but did it anyways because I wanted to try the variety. Actually, I wanted to try half a dozen varieties, but couldn’t justify that expense or that much space in the yard. 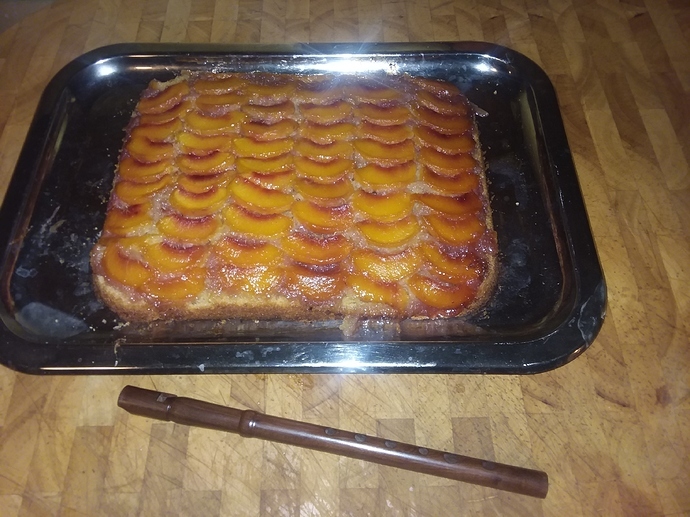 This was the second cake from the Summerset peaches. The first got devoured in no time with the company we had. I’m still eating these fresh. They are just a bit withered, but are super tasty. I don’t think I’ve had better peaches. These are sweet and tangy, with a rich flavor overall, and I am loving having fresh fruit this late. These really seem to keep well off the tree. It’s probably been ten days, and that is at room temperature. The only problem is on fruit that was already damaged. Gonna be keeping this tree for sure! P.S. Our son made the Penny Whistle, and as I thought it was beautiful too, I left it in the picture. It was a single piece of Manzanita wood, and plays two octaves in the key of D.